FUNCTION: BLOG: The holidays are all about giving. We at Function: not only believe that, we live it. Every year, come October, we start talking about the upcoming holidays – when to have our party, when to draw for Secret Santa, who's turn it is to design our mailer (always a source of anticipation) and, most importantly, what cause we'll donate to that year. I count that particular choice one of the best parts of my job here. We get together for our weekly meeting and throw out ideas and suggestions. The decision is made by us all, as a group. This year it was one of my suggestions that we rallied behind. It's been such a bad year, fiscally, for so many all around the country – people out of work, families out of homes, children going hungry. Atlanta has certainly not been immune. I thought it would be nice for us to do something for our community. Make a more local impact. So we donated a nice chunk of change to the Atlanta Community Food Bank. For the mailer, we took the theme and ran with it. 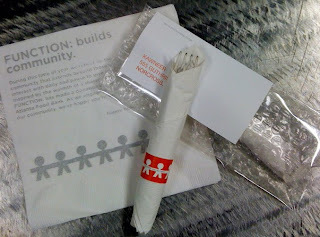 The message was printed on a dinner napkin and then wrapped around a plastic fork, stuffed in a clear bubble wrap mailer and shipped out to spread the holiday giving to our clients, friends, partners and prospects. The finished piece was a big hit. And to make it a particularly special holiday, I was also able to pour some of my non-Function: passion behind the mailing: each napkin was screenprinted by yours truly. The best part about the holidays, for me, truly is giving... Giving the perfect thing to my mom, giving a great time to friends at my annual party and especially giving both on my own and with my company to a very worthy cause.